For most of her life 21-year-old Britney felt caught in the middle torn between two men she truly adored: her father and her step-father. Too often she felt like she simply had to pick between these two men who did not get along. It all began back when Britney was six. Her parents split up then got wrapped up in a bitter custody battle that was riddled with lawyers and court rooms. Her dad, a short haul truck driver, wanted custody and had no interest in sharing his daughter with Britney’s new stepdad who said the feelings were mutual. They simply did not get along. At best, they just tolerated each other. Over the years their relationship had its ups and downs. The two men shared custody of Britney, and eventually both men came to realize they were both pretty good fathers. But there was still tension when it came time for Brittney to get married. Her biological logical father was supposed to walk her down the aisle. But as the moment came on the day of the wedding, all of a sudden he bolted from the front. He said to his daughter, “I’ll be back” and then he walked down the aisle and grab his daughter’s step-father. Our daughter, he said. Our daughter. And that’s when the step father lost it and broke into tears. Hand-in-hand they went back to get Britney and then they gave their daughter the wedding she always dreamed of. Parent and stepparents are often at odds but the wisest eventually realize that getting along is just best for the kids and best for them. You see, these two men realized that they had something in common. That they shared something important. That their lives were connected. And so, they left behind the things that divided them, the differences that existed between them, to focus on the thing they shared and to find a way forward as family. Just what you were hoping to talk about in church today, right? Maybe we should consider “college/university” – then again, with the rivalries here in NC, we might not make it to noon! What would it mean to you to leave behind? What is interesting to me about all these areas that divide us – parties, race and money – is what about them divides us, what it is about them that “owns” us, that we act as if we belong to. And what would it mean to leave those things behind in order to realize that we share so much more in common? It has been said, and I would agree, that the Bible is political. But the bible is not partisan. The election revealed the level of contempt that people of different parties and persuasions had for one another. Yet based upon the book of Corinthians, I believe Paul would ask us today: Were you baptized into the Republican Party? Did the Democratic Party die for you? We could ask those same questions about political figures or leaders….and the answer is no in every case. You see, Life in God should transcend our political differences. And so we must ask: What makes us republican or democrat or libertarian and what would it be like to leave that behind to follow Jesus? What does being white mean to you? That is a hard question and maybe most of us have never thought about it before. Would you trade your whiteness for being a person of color? If so, why? If not, why not? Understanding our attachment to something like race is important…because Jesus asks us to leave behind that attachment and follow him. Consider Ruby Payne (Bridges Out of Poverty) descriptors of middle class – future orientation, achievement, self-sufficiency, management, etc. What would it mean to leave these characteristics of a middle class worldview behind in order to follow Christ? The unity Paul seeks is not in a leader, an ideology, a party, or a system of beliefs…the unity Paul is seeking is about Christ who connects us all by bringing us into his family for our good…for our salvation. When you are baptized, you are saying that Christ matters more than wealth…that Christ matters more than race…that Christ matters more than conservatism or liberalism…that Christ matters more than all else! Christ matters more for ever one of us…and that makes us one. We seek out how to better live THROUGH CHRIST…not through partisanship. We seek out how to better live through Christ…not through money or status. We seek out how to better live through Christ…not through a system that creates racial difference. Faith transcends the differences we have with one another. That does not mean we ignore the differences. Some of the differences are impossible to leave behind. For example, you and I can in no way become “non-white” – society decides we are white and treats us as such whether we like it or not. Same for People of Color. We can try to do good to all people. And yet I may walk down the street tomorrow, walk into a restaurant and see that I am treated better than someone with brown skin. I can respond to that injustice. But I cannot simply walk away from the way society treats me. So, what do we do? How do we live beyond these differences? How do we create a life – a society – where these differences do not divide us? Where these differences are simply beautiful and not things that separate us? Follow the Golden Rule. Work for everyone. Play on the same team. Ensure that the outcomes you seek for yourself are the outcomes you seek for everyone. For differences not to divide us, then differences cannot determine consequences and outcomes for our lives. Teach our children a certain way to live that does not devalue people because they are different, so that the next generation has a better life than us. Learn to live out the truth that “in Christ we have all the identity and purpose we need.” We do not need race because we have Christ. We do not need economic status because we have Christ. We do not need partisanship because we have Christ. 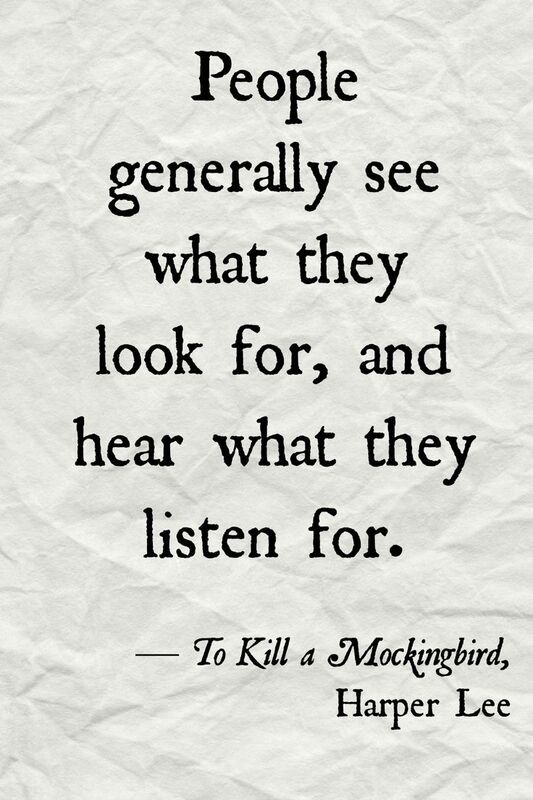 Lastly, quote from bulletin: People Generally See what They Look For, and Hear What They Listen For. Instead, we must learn to see as Christ sees and hear as Christ Hears. And Christ hears the cry of everyone of us. Christ sees the situation of each of us. And Christ cares about each one.